The method for the creation of embroidery applique designs is common in all fashion days. A simple embroidery pattern can be turned into various applique designs on the surface of fabric or garment. In case of children wear dresses, many distinguished or else coordinated fabrics are commenced in case of applique embroidery designs. Further more to this aspect, an extra piece of fabric can also be joined in the surroundings of the embroidery pattern in the form of various shapes for e.g. hearts, animals, words as well as any geometrical shape of your own interest. Either some design or simply a part of the general designing can take the form of embroidery in case of embroidery applique designs. In case of machine embroidery applique use is increasing with every pace. Applique designs for embroidery are used by the people of every age group. Embroidery applique designs can be done in collaboration with the lace embroidery designs. These can be applied on a number of materials. It means that applique designs for embroidery are not limited to the outfits only. Choose any flat, even and plain surface for e.g. table. Place the piece of garment which is already embroidered over it. 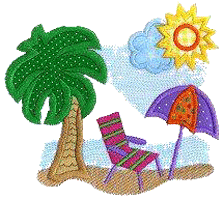 Free applique embroidery designs are available on the internet. If you creative and want to go for your own design then it can be done by the aid of pencil or pen by which you can draw the shape of your own desire in the surrounding of embroidery machine applique designs or embroidery applique designs. The shape needs to be drawn in the outer sides of the embroidery design. In the middle of the edges of both fabric as well as embroidery, a gap of about one inch should be left. The desired shape is cut out by following the lines that were drawn by pen or pencil. The position for the placement of machine applique designs is made on the surface of fabric. This position is fixed by pinning the fabric in the appropriate position. The left edging of the embroidery machine is placed on the perimeter of the applique. The edging of the foot of embroidery machine should be such that it will be similar to that of the edge of the fabric. By using the zig zag stitches of the embroidery machine, sewing should be done in the region of the applique. In the mean while, you should keep you foot to match up in the company of the edging of the garment. The unfastened threads of machine embroidery designs should be clipped so that the fabric from the embroidery machine can easily be released. The pins that were previously incorporated in the embroidery machine applique designs are finally removed away.